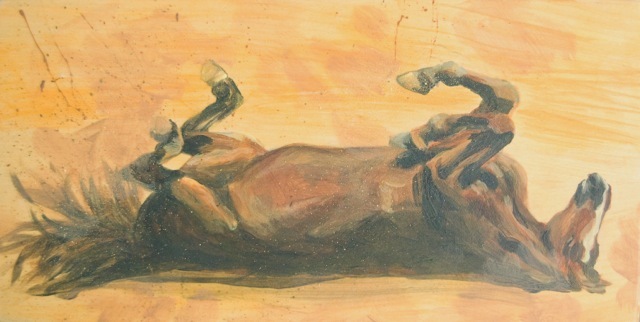 The painting, Pleasure Horse, exists as one of a series of paintings on wood that I am currently working on in my studio. The inspiration for my art sometimes springs from the materials I choose to use. I challenge myself to paint using a limited colour palette and to leave most of the wood bare allowing the wood colour and grain to suggest a sense of place. I endeavor to create a scene that does not exist in reality and at the same time sparks the viewers’ interest by generating questions, emotions and memories. I have painted on wood in the past and recently decided to do a series of paintings on wood again. I enjoy painting wood’s smooth surface. The idea that the painting is an object that can hang on the wall, stand or lie flat on a table or even be carried easily in the hand appeals to me. Visit my website www.clairedomitric.com to view more of my paintings.